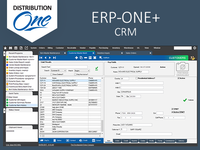 Pros: The strength of ERP1 is in its design and development. Programmers are responsive to making the software work the way your company expects it to work and your employees need it to work. Unlike Prophet 21, ERP1 is a total package, core and all. You aren't bludgeoned and poked to death with dozens and dozens of modules to buy. Also, the company is forward-looking. They create and adapt the product to emerging technology. Cons: I'm struggling to find any dislikes or weaknesses with ERP1 or Distribution One. Anyone shopping for software can get a pretty good idea of how well the product works by peeking under the hood and taking it for a test drive. Prospective customers can't get a feel for how quickly the customer support team will respond. D1 has very good customer service. I can only think of one time when we experienced less than optimal service for an escalated issue in our 5 year history with them. Recommendations to other buyers: I recommend to anyone evaluating new software to look at as many packages as you can. It's important to talk with current users. D1 has annual user's conference that are very, very valuable to owners, managers and IT staff. Pros: There are many things we love about Distribution One. For our company, the total cost of ownership is very reasonable for such a powerful platform. The response from Customer Service is very good. Most times, it is immediate or within 48 hours to resolve issues. Cons: We are on the West Coast, and their hours are scheduled around the Eastern and Central time zones. At the end of our day, when we experience most issues for closing invoices or month end, they are closed and we have to wait for response during the next business day. Recommendations to other buyers: Take a good look at total cost of ownership. Up front price for the software, go-live costs, ongoing maintenance and customization flexibility are extremely reasonable. Also, this software has some of the most powerful reporting capabilities I've experienced. You simply need to know what you want and through Sales Analysis, Dynamic Query and Results Reporting, you can get what ever information you need AND sort it in excel to meet each individual user's preference. This platform has unparalleled flexibility for the enterprise as well as end users. VLC Distribution has had an excellent experieince with D1 products. 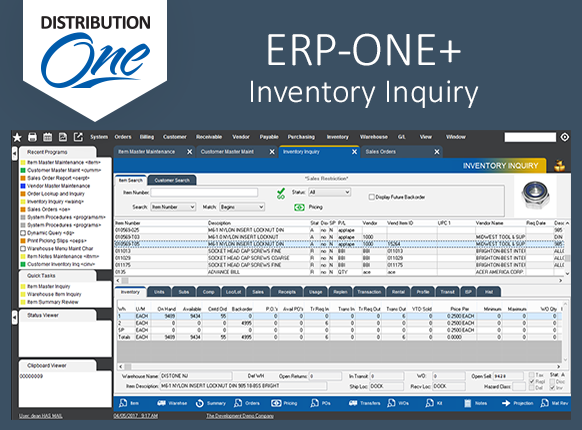 Pros: Solid integration with all business processes-finance/AP/AR/inventory/GL/sales/returns/EDI/etc. Great standard reporting capabilities and plenty of flexibility for custom reports. Vendor is always responsive to custom enhancements and support. 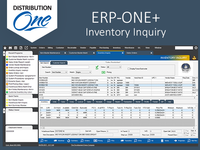 The new ERP-ONE product is superior to the original V2. 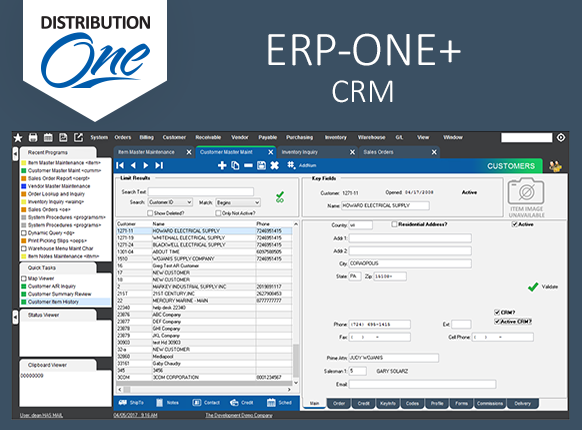 Cons: Distribution One is a solid software platform for a distribution business model where you buy and sell a finished product. Recommendations to other buyers: Be sure to evaluate any custom business processes your company has and what needs to be done to make those processes flow smoothly through Distribution One. 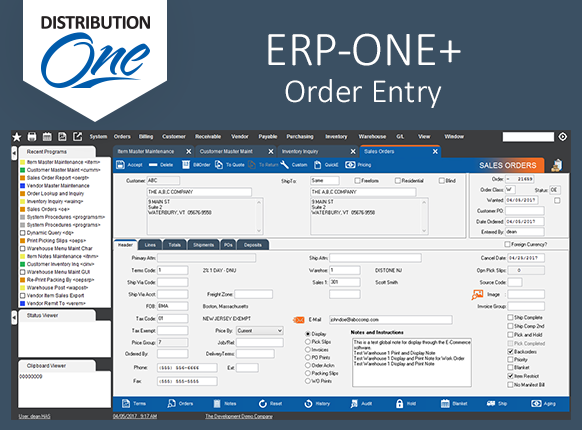 Distribution One has made life much easier! Pros: The product is very easy to use which makes training easier. The ease of moving information to Excel is extremely helpful. Cons: We created detailed work instructions as they did not come with software. Recommendations to other buyers: Get as much information from your old system loaded on spreadsheets. Any new information also get loaded on spreadsheets. It makes conversion much easier and you can utilize the conversion team to add or change any information as they load data. Pros: The technical support is fantastic, from day-to-day needs to customizations. If it can be done, they will do it. Cons: Screen size on some interfaces are a little small and have limited expandability. Recommendations to other buyers: The software is very powerful and capable of handling all of your needs. If you need something specific, talk to the Distribution One technical support team, and they will make it happen. VLC was the beta site for a windows based solution over 10 years ago. Pros: Customization ability to fit our needs. Support is readily available. Cons: Lack of reporting on open help desk tickets. we would like advance notice of updates and what they entail. Pros: Designed for distribution, good intuitive use and graphics. Solid forms and plenty of functional bells and whistles. Cons: When help is needed on specific questions and implementation it is more difficult than it should be to get the full attention of someone who could help. Phone calls are best solutions, email requests often go into a black hole. Solutions discussed with one customer service rep often cannot be completed with that rep because you get the next available rep and you have to begin the process over, instead of picking up where you left off w/ prior rep. Has gotten modestly better recently. Pros: I love the simplicity of the software, very easy to understand. Cons: Sometimes it takes a long time to load and then goes to "expired" page, that is the only issue we have experienced. Recommendations to other buyers: Take your time learning the software because it could be confusing at first. Comments: We have been using Distribution One's ERP product for about 6 years now. Overall, we are very pleased with the system, and we cannot imagine trying to conduct our daily business on any other software. Comments: we could never have grown our business if we had stayed on our old system - the POSB and other enhancements are awesome! Recommendations to other buyers: expense - but worth it! Distribution One is a first-class organization. Pros: Their attention to detail, and the in-depth demos they gave us. We were shown how well ERP-ONE would fit our company. Cons: Haven't found anything not to like. Recommendations to other buyers: Make sure the package is a good fit for your company, you have confidence in the vendor, and feel that they will give you excellent support. Comments: We just went live with ERP One last week. There were some hiccups as the process is very different from our old Order Management System (we went from 4 platforms connecting via API to an all in one platform). So far - we believe that we made the right decision for our medium size company. Pros: Project planning and support was very cooperative, transparent. Cons: NA - I did not have any interaction with this product and vendor that left a bad taste in my mouth. Recommendations to other buyers: Engage D1's team, very helpful! Made this cutover project very smooth.